Are you hoping to upgrade your sleep quality and searching for the best shop in the Detroit area? If you feel comfortable ordering a mattress from your home without trying it first, there are many great options to buy online from a proven and reputable online mattress company with great return policies. If you’d rather try your mattress out before buying, find the best mattress store near your location by using our guide below. According to the CDC, Michigan residents have some of the poorest sleep in the nation, with 38-44% logging less than 7 hours per night. Poor sleep has been clearly linked to a host of health problems, including some of the chronic conditions- like asthma and obesity- whose rates are higher in Michigan. If you’re one of the many busy professionals in the bustling city of Detroit, you may find that you’re not carving out enough time for sleep, and are tossing and turning at night, or are waking feeling groggy. Fortunately, a simple fix can improve your sleep quality. A 2009 study by the Better Sleep Council shows that switching to a new mattress leads to improved sleep. A better mattress helps users fall asleep faster, stay asleep longer, and sleep more deeply and restfully. And fortunately for residents of Detroit, the city has a great number of mattress shops. Many specialize in affordable mattresses, with closeout and overstock inventory. Some carry comfort models designed to alleviate sleep problems like back pain or snoring. Others sell furniture and appliances as well as mattresses. With all the options, you may be wondering which is the best place to buy a mattress in Detroit? We’ve combed the listings and reviews to narrow down the many options. Our guide to the Best Places to Buy a Mattress in Detroit highlights the top-reviewed and most popular options in each geographical area of the city. 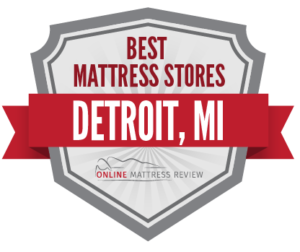 Read on to find the best mattress stores in Detroit, right in your neighborhood. There are plenty of places to buy a mattress in Central Detroit. One of the highest-rated is Budget Appliance and mattress (12070 Greenfield Rd), which offers reasonably priced appliances and affordable mattresses. Don’t look for a fancy showroom here- the inventory is stacked in a warehouse-style setting, but attentive sales staff making finding the right product easy. Reviewers praise the store for professionalism, pricing and responsive customer service, as well as speedy delivery. Nationalwide Furniture (10570 Gratiot Ave) carries mattresses by Chicago Mattress Company and Serta, with models ranging from economy to comfort, as well as traditional and adjustable beds. The store runs regular specials, so prospective customers would do well to research their current offers. Another option for affordable mattresses is Mattress Wholesale (14510 W 8 Mile Rd), a well-reviewed and reliable local chain with factory-direct prices. The area of North Detroit has a number of excellent places to buy a mattress at an affordable price. Up on the border of Oak Park, Mattress Wholesale (14510 W 8 Mile Rd) is a great place to score a bargain on a new mattress. Customers give rave reviews to this family-owned, local chain’s professional sales staff and reasonable prices. The store carries mattresses by Serta, Sealy, Englander, and Corsicana Bedding, along with select bedroom furniture. Over in the Bel Air Center, Romeo and Juliet Furniture Liquidators (9810 East 8 Mile Rd) has earned an impressive 204 Google reviews with an average of 4.5 stars. Rome and Juliet is the largest furniture store in Detroit, and sells high quality living room sets, dining room sets, and bedroom sets at deep discounts, along with a selection of highly affordable mattresses. Because the store specializes in closeouts and overstock, the inventory rotates frequently and varies greatly. Customer report scoring amazing deals, especially when buying more than one item, making this an excellent place to buy a mattress along with a bed or bedroom set. Bill and Rod’s Appliance and Mattress (15870 Middlebelt Rd) is another place to buy a mattress at an affordable price, along with large home appliances like washers and dryers. This family-owned local business has been around since 1963, and salls a selection of Serta mattresses in innerspring, gel memory foam, memory foam, and hybrid models. There are a few places to buy a mattress in South Detroit, both of them furniture stores that stock mattresses. Danto Furniture (7701 W Vernor Highway) has been in business for 77 years, and sells both furniture and mattresses at discounted prices. The store has earned an impressive 5 star rating on Yelp for its affordable prices, and sells a selection of economy mattress brands, including Ashley Sleep, Coaster, Sierra Sleep, and Englander. Over in the Warrendale neighborhood, Detroit Furniture (16427 W Warren Ave), is another family-run furniture and mattress shop. Detroit Furniture stocks a selection of mattresses by Serta, Corsicana, Five-Star, and Sierra Sleep, all at factory-direct prices. Out along East 8 Mile Road can be found a cluster of furniture and mattress stores that offer a wealth of options for those looking to buy a mattress in East Detroit. There’s Big Daddy’s Furniture and Mattress Liquidators (12732 E 8 Mile Rd), Bargain Furniture (12700 E 8 Mile Rd), Global Appliances (13007 E 8 Mile Rd), and Art Van Furniture (13855 E 8 Mile Rd). Of these, Art Van has the largest mattress selection, with a wide selection of mattress brands and models, as well as bedding, mattress toppers, adjustable and traditional beds, box springs, and mattress protectors. This Midwest chain has 100 locations, has been in business for 60 years, and supports a number of charities and green initiatives. The store offers recycling of customers’ old mattresses, as well as free delivery on many mattresses. Customers can choose between no less than 15 mattress brands, from luxury (such as Tempur-Pedic) to economy brands (like Bedgear), and many models are available from each. The highest-rated place to buy a mattress in East Detroit, on the other hand, is Bargain Furniture. This locally-owned business has been in operation for 25 years, and has earned a solid reputation for excellent customer service and reasonable prices. In addition to furniture, the store sticks a number of affordable mattresses, with innerspring, memory foam, gel and hybrid options. Brands available include Sierra Sleep, Ashley Sleep and Coaster. 5th Avenue Furniture (15348 Livernois Ave) is Detroit’s top-rated furniture store, and a great source for an affordable mattress. The store carries innerspring, memory foam and gel mattresses, and has earned an incredible 347 Google reviews, with a 4.8 star average. Customers praise the store’s friendly and professional staff, and the discounted prices on furniture and mattresses, which are a fraction of retail. The store runs frequent special offers and promotions, and customers can save even more by shopping during one of their seasonal sales. Livernois Appliances and Mattresses (14040 Livernois Ave) sells reasonably-priced washers, refrigerators and other large appliances, along with economical mattresses and mattress sets. This store has a warehouse (rather than showroom) arrangement, so customers would do well too enlist the help of the sales staff to locate the right product.